This is the wolf spider Arctosa perita, probably still a juvenile but identifiable from the abdominal pattern. It likes open ground and sandy places. Have you got an Ordnance Survey grid reference and date for your record? This small (probably about 9mm across?) spider was burrowing into a small hole in open, sandy soil on heathy grassland at Calley Heath Yorkshire Wildlife Trust reserve. It spent some time underground, arranging the granules at the mouth of its burrow, with just the tips of its legs visible. It only emerged when an ant disturbed it from its hole. Just a genus would be interesting. Thanks for any help with what it is. Thanks very much for the location details. They are quite widely distributed (see Summary/s/Steatoda+grossa ). They used to be very scarce in south-eastern England, but seem to have become more common in recent years. Thank you for your resonse - much appreciated. This picture was taken in Abindon, Oxfordshire OX14 4BZ on Sunday 19th May. Are they common in the UK as I have not seen one before? Assuming there is no obvious pattern on the part of the abdomen not visible in the photograph, then I think it is safe to say this is Steatoda grossa, yes. Can you provide a postcode or Ordnance Survey grid reference so that we can add your record to the recording scheme. 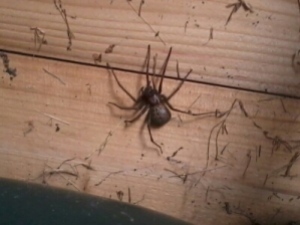 Please see attached image of an unusual spider I came across whilst disassembling a summer house in a garden in Abingdon Oxfordshire. I found it underneath the base (floor) of the summer house. There were three of the same species, and I took this photo of the lager one which was about the size of an average grape. I touched the spiders abdomen and it instantly curled into a ball to protect itself by wrapping its legs around its body. 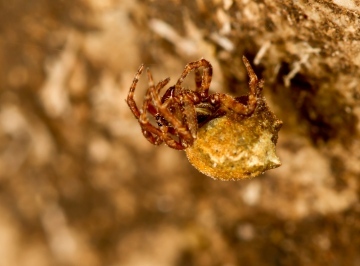 I have been intrigued as I am 33 years old and have not came across this species of spider in the UK. Please can someone help me to identify this? Glyptogona sextuberculata. It is an Araneid! Thanks Peter so it is a Theridiid. It behaved like one in the wild. I have googled Phoroncidia and most pictures look similar but not very like it but I have also found a couple of images that look exactly like it attributed to the name but not authoritatively. So am asking around! The Med is wild country spider-wise! Certainly not Cyrtophora citricola, which is a colonial spider found in large complex tent webs in large bushes. It looks like Phoroncidia paradoxa or similar, unless it is a Hyptiotes? The male is not adult (no structure to the swollen palps, just bags). Don't know about the female. Could it be something like Cyrtophora? They are about 3-4 mm. I found the male upside down under what I thought was a very fine sheet web(!!) between stones at ground level. The female I found under a stone close by and I must have destroyed her web in turning the stone. They could be immature although I had assumed not - in fact they look immature on close inspection of photos. Cyrtophora is a really big spider. I know it well with it's domed sheets in things like prickly pear in southern Spain. Here is a side view of the female. Getting an Araneid sort of feeling? Is it a Theridiid or an Araneid? Still stumped! I just uploaded a picture. Therdiids??? Another Corfu find. Do you know it Peter? Your jumping spider is almost certainly Sitticus pubescens, usually a spider of walls and fences in gardens. Sitticus distinguendus is a species very unlikely indeed to occur in gardens, and is currently only known from a small area at West Thurrock Marshes on stony saline (slightly salty) habitat, where it is present in reasonable numbers, and in a small area of chalky ground on Swanscombe Peninsula, across the river from West Thurrock, where only very few spiders have been found. 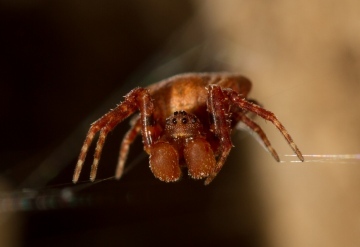 If you can get a decent photograph of your spiders, it might be possible to be sure. Hello everybody, I've just registered here after hearing about the recent discovery of this species on the Swanscombe Peninsula (site of the proposed new Disney park). Being far from knowledgeable about spiders myself, I wondered if someone here might know if this particular spider is very similar to other, perhaps less rare, jumping spiders please? The reason I ask is because I've lived in Swanscombe since the age of 2 (am now 50! ), roughly 1-1.5 miles from this particular site. As a child, I can clearly remember watching small black/dark brown and white jumping spiders scurrying in and out of the holes in the garden wall at my parents' home and they're still there even today. Might it just be coincidence, or could this species in fact have been living locally for much longer than is thought, do you suppose? Any opinions gratefully received, thank you very much! 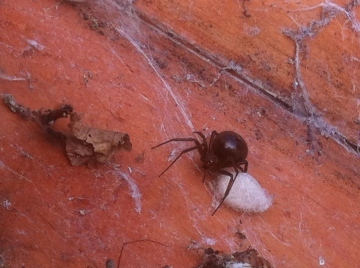 Can't be sure from picture, but could be female Steatoda grossa?? 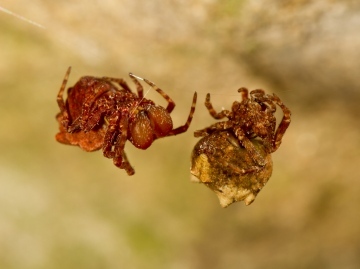 See Steatoda grossa and Steatoda grossa picture page. Does anyone know what this spider is? Peter that was too fast! Yep, found two in Corfu. But check out the front leg hairs! They are iridescent with a bright green look. At first I thought my first specimen had a bit of fresh grass stuck to it's leg. Spider-hunting spider this is! Your What the heck picture from Corfu is Palpimanus gibbulus, a nice spider. Fortunately the only species in the genus in Europe.